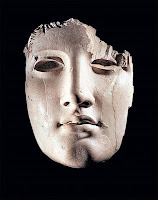 A picture is beginning to emerge from a study of the return of antiquities to Italy (and Greece). The view is not yet complete as full details about the dealers lying behind the Metropolitan Museum of Art, Princeton, and Shelby White returns have yet to be released. the ex-Tempelsman pieces apparently from Sicily in the University of Virginia Art Museum in Charlottesville. So museums, private collectors and dealers need to check that they are not holding items (or stock) that had passed through Symes' hands. They should also remember that one piece was recorded with the euphemism as coming from "a private collection in Great Britain". Or perhaps it would be recorded as the "R.S. European collection". It is a reminder that museums need to do more to present full recorded histories for individual pieces (which is why I welcome the new policy of the American Association of Museums).